The legend can be printed at 4" × 6". The bitmap resolution is 600 dpi. For every case, we sequence the DNA to study the genome structure and the RNA to discover which genes are expressed and to what extent. The analysis is quite complex and brings together many steps: sequence alignment, structural variation detection, expression profiling, pathway analysis and so on. Every case is "summarized" by a lengthy report, such as the one below, which can run to over 40 pages. ▲ A report for a typical POG case is about 40–50 pages. One of the goals of the 5-year anniversary art was to represent the cases in a way to clearly show their number, classification as well as diversity. There are many metrics that can be used and I decided to choose the case's correlation to other cancer types. 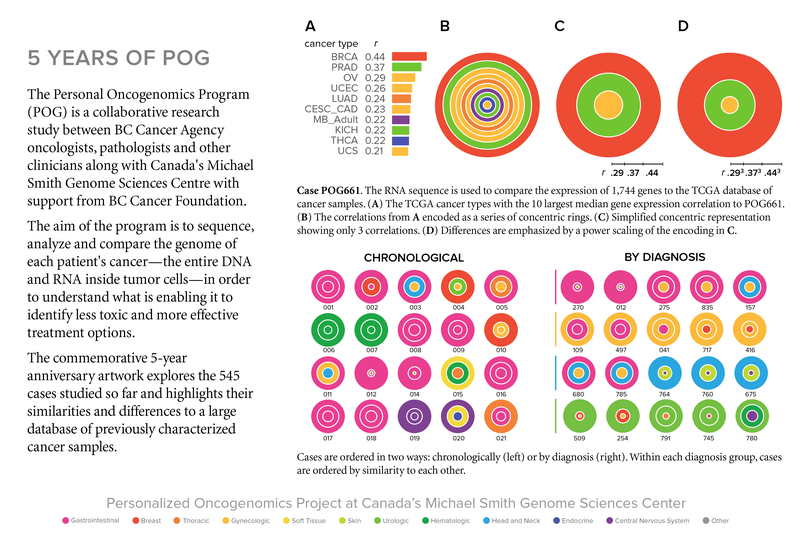 For every POG case, the gene expression of 1,744 key genes is compared to that of 1,000's of cases in the TCGA database of cancer samples. For a given cancer type in the TCGA database (e.g. BRCA), we visualize the correlations using box plots. The box plot is ideal for showing the distribution of values in a sample. In the figure below I show how the final encoding of the correlations is done. First, the top three correlations are taken—using more generates a busy look and diminishes visual impact. 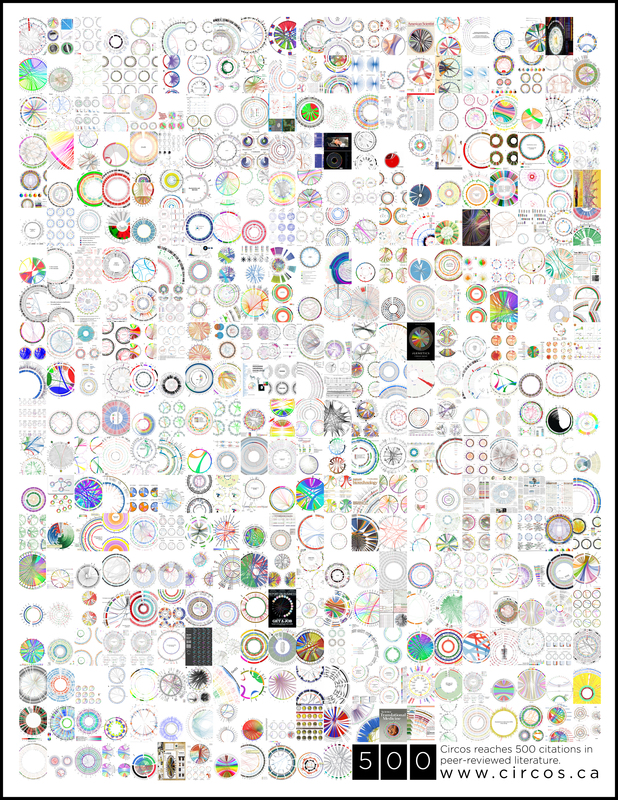 The correlations are encoded as concentric rings. Because in most cases the differences in the top 3 correlations are relatively small, differences are emphasized by non-linearly scaling the encoding (the correlations are first scaled `r^3`).